"I hope we get a good lift. Our fans are excited. It's been a long time coming," Carolina coach Rod Brind'Amour said of his team hosting a playoff game for the first time since May 26, 2009. It would behoove the Hurricanes to get off to a better start, as the club has fallen behind early in both contests in Washington. Nicklas Backstrom scored twice to highlight the Capitals' three-goal first period in Thursday's 4-2 win and joined T.J. Oshie in tallying the opening session on Saturday before defenseman Brooks Orpik converted 1:48 into overtime for the 4-3 victory. "Just like it was drawn up," Leonsis quipped after the goal by the 38-year-old Orpik, who has scored just four times in 151 NHL playoff games. ABOUT THE CAPITALS: Alex Ovechkin feels as though he has reversed roles with Backstrom thus far in the series, with the superstar captain answering his NHL-best 51 tallies this season by playing more like a distributor in the first two games versus Carolina. "Right now, Backy is a scoring machine and I'm Backstrom," said Ovechkin, who has a goal and two assists in the series. 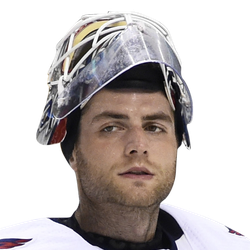 While the forwards may have temporarily changed roles, Braden Holtby has been extremely consistent as the former Vezina Trophy recipient has turned aside 196 of 209 shots in his last seven contests (7-0-0) -- with four of those victories coming against Carolina. ABOUT THE HURRICANES: Leading goal scorer Sebastian Aho was in no mood to celebrate after scoring from a sharp angle late in the second period to snap a 15-game goal drought. "It's not like we're playing bad, but this time of year, you've got to get that extra step and play even better," the 21-year-old Finn said. "OK is not OK. We just have to try to play our best." Lucas Wallmark collected his team-leading third point of the series with a late first-period goal before rookie Andrei Svechnikov matched his total by setting up Jordan Staal's power-play tally with five minutes remaining in the third to forge a tie at 3. 1. Carolina D Dougie Hamilton and LW Micheal Ferland did not receive any supplemental discipline from the NHL following their respective hits on Washington Cs Evgeny Kuznetsov and Nic Dowd in Game 2. 2. Although Kuznetsov is tied with D John Carlson with a team co-leading three assists in the series, he has lost 19 of 28 faceoffs. 3. 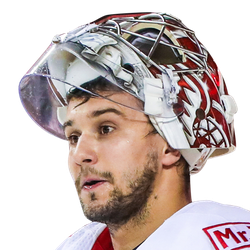 Hurricanes G Petr Mrazek has turned aside 43 of 50 shots in the series. Capitals are 6-0 in their last 6 Conference Quarterfinals games. Capitals are 6-1 in their last 7 vs. a team with a winning record. Over is 4-1 in Capitals last 5 games as an underdog. Under is 6-0 in Hurricanes last 6 Monday games. Hurricanes are 4-0 in their last 4 Monday games. Hurricanes are 4-0 in their last 4 playoff games as a favorite of -151 to -200. Hurricanes are 4-0 in their last 4 games as a favorite of -201 or greater. Hurricanes are 4-0 in their last 4 games as a home favorite of -201 or greater. Capitals are 11-3 in their last 14 playoff games as an underdog. Capitals are 6-2 in their last 8 playoff games as an underdog of +151 to +200. Capitals are 5-2 in their last 7 games as a road underdog. Capitals are 5-2 in their last 7 road games vs. a team with a winning home record. Capitals are 7-3 in their last 10 road games. Capitals are 37-16 in their last 53 vs. Metropolitan. Capitals are 150-71 in their last 221 games playing on 1 days rest. Capitals are 35-17 in their last 52 Monday games. Capitals are 57-28 in their last 85 vs. Eastern Conference. Capitals are 6-13 in their last 19 playoff games as an underdog of +110 to +150. Capitals are 7-19 in their last 26 games as a road underdog of +201 or greater. Capitals are 14-38 in their last 52 games as an underdog of +201 or greater. Hurricanes are 5-1 in their last 6 games as a favorite of -151 to -200. Hurricanes are 4-1 in their last 5 games as a home favorite. Hurricanes are 4-1 in their last 5 games playing on 1 days rest. Hurricanes are 8-2 in their last 10 games as a home favorite of -151 to -200. Hurricanes are 4-1 in their last 5 home games. Hurricanes are 4-1 in their last 5 vs. Eastern Conference. Hurricanes are 21-7 in their last 28 games as a favorite. Hurricanes are 12-4 in their last 16 playoff games as a favorite. Hurricanes are 6-2 in their last 8 games as a home favorite of -110 to -150. Hurricanes are 5-2 in their last 7 playoff games as a favorite of -110 to -150. Hurricanes are 21-10 in their last 31 overall. Hurricanes are 4-10 in their last 14 home games following a road trip of 7 or more days. Hurricanes are 1-5 in their last 6 vs. a team with a winning record. Under is 6-2 in Capitals last 8 overall. Over is 6-2 in Capitals last 8 road games. Under is 3-1-2 in Capitals last 6 playoff games as an underdog of +151 to +200. Under is 5-2 in Capitals last 7 games playing on 1 days rest. Under is 5-2 in Capitals last 7 vs. Eastern Conference. Under is 5-2 in Capitals last 7 vs. Metropolitan. Over is 7-3-1 in Capitals last 11 Monday games. Over is 6-1-1 in Hurricanes last 8 home games vs. a team with a winning road record. Under is 6-2 in Hurricanes last 8 vs. Eastern Conference. Under is 16-6 in Hurricanes last 22 games as a favorite of -151 to -200. Under is 13-5-2 in Hurricanes last 20 home games following a road trip of 7 or more days. Under is 10-4 in Hurricanes last 14 vs. Metropolitan. Under is 5-2 in Hurricanes last 7 vs. a team with a winning record. Under is 7-3-2 in Hurricanes last 12 Conference Quarterfinals games. Under is 34-16-1 in Hurricanes last 51 games as a home favorite.